Did Israel intentionally ignite Gaza war to thwart peace efforts? For weeks, leaders of the militant organization Hamas have declared their intention to avoid an escalation in fighting with Israel that would result in casualties on both sides. But Israel’s extremist government just can’t stop itself from taking a bad situation and making it worse. Despite what many believed could become a new suspension of violence by both sides, ending the wave of killings and tensions along Gaza’s borders with Israel, Tel Aviv on Sunday dispatched a team of undercover officers dressed in civilian Arab clothing, including as women, into Gaza. Hamas leaders had recently said they hoped to avoid any conflicts with Israel, while Israel’s government had allowed an increase in fuel to enter Gaza, as well as electricity, to ease the suffering inflicted on the 1.8 million Palestinians who live there under brutal siege. Egypt, Qatar and the UN have been trying to broker an agreement to bring down the level of violence and end the Gaza border killings. Qatar even reportedly dispatched millions of dollars to Hamas to ease the economic despair of Gaza’s population. More than half of Gazans live in poverty, and they will suffer more in the wake of the decision to cut US funding for organizations like the UN Relief and Works Agency, which helps Palestinian refugees. In September, the World Bank warned that the Gazan economy was near total collapse. There was even talk that the long-running massacre of Palestinian civilians along the Gaza border, which began as weekly protests on Land Day, March 30, might ease and even end. The demonstrators have also been protesting the blockade enforced by Israel since 2005, when it withdrew its settlements and soldiers, and with help from Egypt beginning in 2007. All Israel has to do to empower peace is ease its embargo on the Gaza Strip and military oppression in the West Bank. Heavily armed Israeli soldiers positioned behind protective barricades have used high-powered sniper rifles to shoot and kill hundreds of civilians, most of whom were doing little more than protesting — yelling and screaming against Israel’s 51-year occupation. Among the dead are nurses, reporters, activists and even children, along with Hamas militants who were helping to organize the protesters. For no real reason, Israel’s undercover assault may have started another fight that promises to escalate and claim even more lives. 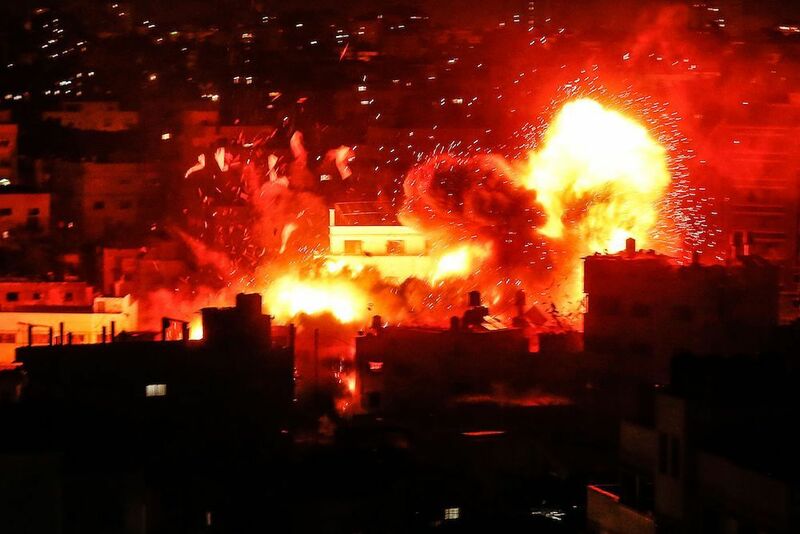 Within hours, Israeli fighter jets were screaming across the Gaza Strip dropping bombs and destroying homes and buildings, while Hamas has been firing rockets indiscriminately into Israeli territory, giving Tel Aviv an excuse to blame Hamas for threatening Israel’s Jewish population. Worsening the crisis is the growing tension between Hamas and the Palestinian Authority (PA), the governing body of the Palestinians based in the Israeli-occupied West Bank. Angered by the escalation, PA President Mahmoud Abbas accused Hamas of thwarting the establishment of a Palestinian state that includes all of the West Bank and Gaza. Marking the 14th anniversary of the death of Palestinian President and hero Yasser Arafat, Abbas said he was surrounded by conspirators, blaming the Americans, Israel and Hamas for obstructing peace. Part of the tension stems from the increasing financial crisis in Palestinian society, not just in Gaza. Despite the obstructionism from Israel and the US, Hamas remains the key obstacle to Palestinian statehood. Hamas has proved to be a formidable military force and has survived several full-scale Israeli military invasions and dozens of skirmishes that have claimed the lives of tens of thousands of Palestinians and hundreds of Israelis. But blame for the continuing conflict also rests on the shoulders of Israel, which continues to empower Hamas by undermining the Palestinian government in Ramallah. The White House’s decision to cut financial aid has also weakened the PA, fueling public anger and frustration, which also feeds into Hamas’ strength. The latest violence demonstrates how Israel can easily engage in violence to kill Palestinians while minimizing the killings of Israelis. But, clearly, Israel doesn’t seem to know anything about peace. All Israel has to do to empower peace is ease its embargo on the Gaza Strip and military oppression in the West Bank. It needs to facilitate communications between Gaza and the West Bank, with the goal of nurturing one government empowered to represent both. But maybe Israel wanted the peace efforts to collapse. Why would it have dispatched an undercover team into Gaza other than to provoke another major conflict?